Should you have an Engineers report carried out? Our Independent Surveyors are happy to provide an engineer's report on specific defects such as cracking, dampness etc. However, we would comment that looking at a problem in isolation can often mean that you miss other problems. 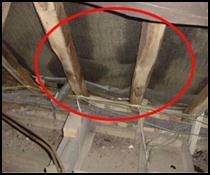 From our experience we have found that surveyors not qualified in this area can wrongly diagnose the problem. That is why we suggest it is safer to look at the property as a whole rather than for a specific defect. We tend to find that a problem comes from several issues or problems. Why not call us on Free phone 0800 2985424 to see how much a building survey is for your property and have that extra peace of mind. If you truly do want an independent expert opinion from a surveyor with regard to engineers reports, building surveys, valuations, mortgages, mortgage companies, surveys, structural reports, specific defects report, structural surveys, home buyers reports or any other property matters please contact 0800 298 5424 for a surveyor to give you a call back. Please call us and we will be glad to email you several examples of our tailor made reports. If you look at the surveying and property articles on our website we use lots of sketches and photos in these and in our reports. From the feedback received from our clients these make it easier to understand the reports. What do the ovals and circles mean? Within our reports you will find that some photos and sketches have circles or ovals on them. The circles and ovals are a system that we use within our structural surveys and building surveys to highlight problem areas so that you are not left wondering what the problem is.